In Riverview Community Centre, the old schoolhouse in Clyde River, there are books tucked away in the library whose glory is now in the past. The odd assortment ranges from the early 1900s to the last days when students crossed the threshold to the little room and the big room before school consolidation in the early 1970s when they were then bused to Cornwall and Charlottetown. These were the times of modernized education which broke off from the earlier days when one’s small community and school contributed to the education of young men and women. In those humble school rooms, where families were not too many generations from Scotland and England, literature was considered an essential part of their early and oftentimes brief education. My mother, in the last years of her long life, could still recite poems she was required to memorize in her days at Clyde River School. They were poems that she would carry through life and, at each stage of her years, the rhythm and nuance of the lines would resonate a little more deeply. Maybe it’s time to dust off those old books and peak inside to gather a glimpse of their learning. 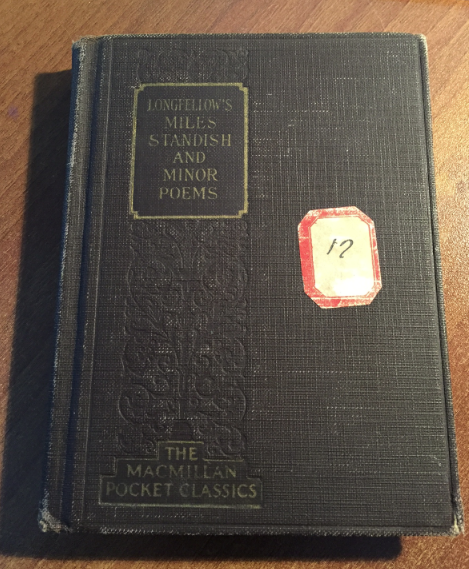 Our first book is a MacMillan Pocket Classic featuring Longfellow’s The Courtship of Miles Standish and Minor Poems. The introduction by Dr. Will David Howe, Professor of English at Butler College, introduces us to Henry Wadsworth Longfellow. Henry was born in 1807 in Portland, Maine. His parents were Stephen and Zilpha (Wadsworth) Longfellow, descended from Yorkshire families who had emigrated in the later half of the seventeenth century. They named him after his uncle, a Navy Lieutenant who had died at the Battle of Tripoli three years earlier. His poetry was strongly influenced by the countryside where he grew up among beautiful views of the bay, mountains and forests. Music and reading were highly valued in their home. Longfellow wrote a letter to his father to express his desire to pursue an education in literature of which his father was not pleased. He already knew French, but wanted to learn Italian so as to understand the language of literature. He attended Bowden College, a liberal arts college in Maine and later taught there. He travelled to Europe where he studied German, Dutch, Danish, Portuguese, Finnish and Icelandic languages. He secured a distinguished professorship of Modern Languages at Harvard. He became a full-time poet in 1853. His first wife died in childbirth in 1835, four years after they were married. He married his second wife in 1843 and they had six children, but she died tragically in 1961 when her dress caught fire despite Longfellow’s heroic attempts to save her. Longfellow never recovered from her death. He spent much of the following years translating foreign language works until his death in 1882. Longfellow’s family history offers some familiar parallels to early settlers to North America. Children were often named after someone beloved who had an untimely death. Parents wanted desperately for their children to have a better life in a new land. He was highly influenced by the beautiful landscapes that surrounded his home, and there remained strong ties to his ancestral home. His sister died of Tuberculosis. Often wives died in childbirth, and tragedy happened leaving children without a mother and where a husband was forced to live out his days as best he could, tending to a large family. Longfellow’s life’s desire was to promote modern literature to those beyond the highly educated elite in America. Within his lifetime, he became one of the most popular poets. For now, in the depths of February, with the hope of summer in our hearts, we will feature his poem, Woods in Winter. It was written in 1839 while he was renting accommodations at a house that was once the headquarters of George Washington, a home that he later owned and is now the Longfellow House in Cambridge, Massachusetts. That overgrows the lonely vale.